Welcome back fellow readers. This week I have a series I have been meaning to read for a while now. It is in my eyes the basis for the version of Oliver Queen from Arrow, as well as the newest origin for the Green Arrow character. It begins with Oliver Queen and an associate Hackett, who is helping him to find his next big thrill in the frozen tundra. It is obvious from the first panel that Oliver is nothing more than a spoiled orphan running from all responsibility and pain in his life. Oliver is reckless and almost gets himself killed by rushing across an ice bridge that can’t handle his weight. Within the first three pages you get all the backstory you need about Oliver and Hackett’s relationship and where Oliver is in his life. But Oliver’s spoiled rich kid antics don’t end there. While Oliver and Hackett are attending a charity event for Star City Drug Rehabilitation Center, Oliver has a little too much to drink and bids one hundred thousand dollars for an archery set that belonged to the archery double for Errol Flynn. After such a generous bid, Oliver is asked to give a speech. But in his drunken state he makes a fool of himself and insults most of the local socialites. When he sobers up and realizes the mistakes he made Oliver decides to take a trip with Hackett to make an illegal business real estate investment that Hackett was going to handle for him. What Oliver doesn’t know is that Hackett was going to run away with his money with no plans on returning. By being on the trip, Hackett now has to get him “out of the way”. So Hackett knocks him out and dumps him overboard figuring that he would drown or a shark would get him, since he couldn’t bring himself to kill Oliver like he was supposed to. When Oliver comes to, he is alone on a island with nothing but the clothes on his back. He moves inland in hopes of finding fresh water and shelter, but only finds a burned out fishing village. But in the wreckage of the village he finds the parts neccesary for making a crudely made bow and arrow. He teaches himself to hunt and make fires so he can eat and boil water. It doesn’t express how long Oliver is on the island before it happens, but after sometime Oliver spots a plane over the island. When he attempts to signal the plane it circles back around and attempts to kill him. But he manages to shoot it down, which leads him to find an opium farm at the center of the island. A opium farm run by the infamous China White and Oliver’s old friend Hackett. Oliver gets injured in the following battle, leaving him with a broken arm and a few bullet wounds. He is once again left unconscious. When he wakes up this time he is being nursed by one of the slaves of the opium farm. She resets his arm and gives him opium for the pain then leaves him promising to come back the next day if she can slip away from the fields unnoticed. Through repeated visits Oliver becomes hooked on the opium, and learns that the slaves believe he is the savior they have been waiting for. The “Auu Lanu Lau’ava” or Green Arrow. I won’t ruin the rest of the story, but it really builds a backstory that would explain why Oliver becomes the man that he becomes. Diggle really brings out the heart of the character of Oliver Queen. He takes a character that was created as a Batman rip-off and gives him a fresh origin that makes him completely unique. He makes the transition of Oliver from a spoiled rich kid to a selfless hero of the people relatable and compelling. Even though it is pretty well known how the story of Oliver Queen goes, Diggle makes the journey interesting. As for the art. Jock brings his top game. It isn’t the dark style that Jock is known for. But that style wouldn’t work for this book in my opinion. He composes some pretty dynamic panel layouts, and when the action picks up his art really brings a frenetic pace to the pages. This arc has to be one of the best Green Arrow stories I have ever read. Second only to Longbow Hunters in my eyes. Diggle and Jock made such a good team and really remade the character well. I want to try something different this time around and throw in some suggestions for other stories to read. 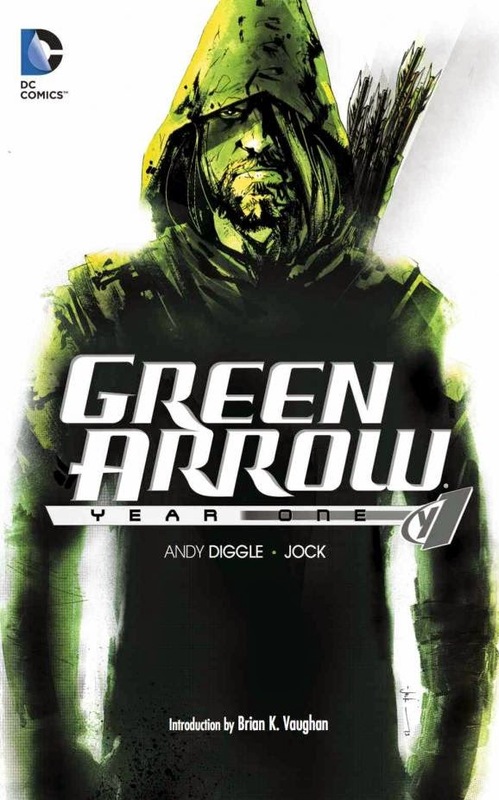 If you liked this arc or are just interested in reading some good stories of Green Arrow these are the books I would suggest. Oliver and Dina move to Seattle to open a florist shop. And are drawn into an investigation into a murderer. This arc was the first series to show Oliver abandoning the trick arrows for plain old steel tipped arrows. Oliver is returned from the dead, but he doesn’t realize that he ever died. And when he reconnects with the JLA they find that his memory is missing some key events from his life. A futuristic Yakuza tale about a high ranking lieutenant in the Yakuza organization who is killed for loving the bosses girl. But he is given a second chance through a robotic body to go back into the Yakuza and exact his revenge. As always. Thank you for reading my review. If you have any comments or recommendations for books you would like to see me review please leave a comment. And as always, keep reading comics fans.